When my wife and I began cooking frequently, one of the first recipes I wanted to learn how to make was spanakopita. Spanakopita is a classic Greek dish, consisting of filo dough pastries filled with spinach and feta cheese. My ancestry is part Greek-Jewish (my grandfather’s family came here from Greece), hence my interest in preparing the dish. I enjoyed eating them when I visited Greece on a family vacation in 1999. My wife and I have prepared this dish several different ways. Usually, we use pre-made filo dough, which can be purchased at any supermarket. This dough has a nice texture and is light and airy when filled and baked. The downside is that it is difficult to form with your hands because of its flaky texture and the pastries are never professional looking. It rips apart easily. 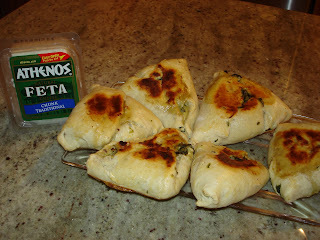 Tonight, we prepared spanakopita using filo dough that we made in our artisan mixer. We were initially planning on using store bought filo dough that had been frozen. However, the filo was no longer in good shape and broke apart when I touched it. Hence, my wife filled in by quickly preparing her own filo dough. This homemade dough was also tasty and easier to shape into a nice triangular pastry, because it is malleable. However, it is decidedly less crisp and flaky than the store bought filo dough. After doing a little bit of research, I learned that this homemade filo is actually closer to the more genuine Greek filo dough, as most Greeks preparing the dish will make the dough themselves using a similar recipe as we did. Although this is the authentic way, I personally prefer the thin and crispy store bought filo dough for a lighter pastry that highlights the spinach & feta filling. However, my wife, Sasha preferred the homemade version. After you prepare the filling, make the dough in your artisan stand mixer. You can add a little extra flour if the dough is too sticky. When you have the dough at the right consistency, roll it out on a flat surface using a rolling pin. Cut large circles on the dough and fill with the filling. Then fold the dough over and pinch into a triangle, much the same way as you would prepare a hamentaschen. When the pastries are done, glaze with an egg wash, consisting of one beaten egg and 1 T of melted butter, using a pastry brush. Bake at 400 degrees for about 40 minutes, or until the spanakopita are lightly browned. Note: This recipe makes about 12 good-sized spanakopitas. If you want to make less, you can easily cut the recipe in half without a problem. You could also make them smaller, as an appetizer, rather than as a main course. This article was written with a bit of assistance from my wife, Sasha.